Salmon Caesar Salad: EASY + Healthy, with Simple Homemade Dressing! This Salmon Caesar Salad is a healthy and delicious take on a classic Caesar. It features easy homemade dressing, freshly baked croutons, and pan-seared salmon. Who else thinks salads always taste better at restaurants? Who else ALWAYS orders a salad when they go out to eat, but is filled with sudden salad-apathy when you think about making a salad at home? Or is that just me??? I don’t think it’s just me. Well guys– I’ve got news for you. Salads can be JUST AS AMAZING at home! The thing is, restaurants follow a recipe for their salads. Restaurants plan out what will go on their salads, instead of just indifferently tossing vegetables into a bowl. But that doesn’t mean that salads need to be difficult to be fabulous! This Salmon Caesar Salad is the bomb diggity– it’s got protein, it’s got croutons, it’s HEALTHY, it comes together quickly, and it is delicious! For this Salmon Caesar Salad, I grabbed some pink salmon fillets. Pink salmon is a type of wild Pacific salmon. Want more pink salmon ideas? Try these: Salmon Sandwich with Dijon Sauce, Pesto Salmon, and Pink Salmon Recipes. Learn more about salmon: Wild Salmon vs. Farmed Salmon. Once you’ve got the salmon, it’s time to get cookin’! Since Caesar salad only has a few components– it’s important to make sure each one tastes the best it can! And that means– homemade croutons. About a month ago, I made the most delicious, decadent, and buttery croutons I’ve ever tasted in my life when I made this recipe for Garlic Croutons from Amanda at Striped Spatula. They were INCREDIBLE. For this salad, we’re making a much lighter and quicker crouton that was inspired by Amanda’s buttery croutons, but if you want a little bit of buttery heaven on your salad– you can swap the croutons in this recipe for her crouton recipe. For my lightened-up croutons, simply toss cubed bread in a little olive oil and freshly grated garlic, and bake them until they’re lightly toasted. Next, make the dressing. Traditional Caesar dressing includes anchovies and garlic (yum! ), but it also includes the somewhat tricky process of emulsifying oil into raw eggs. We’re skipping the tricky part. For this Salmon Caesar Salad, we’re making the dressing right in the salad bowl. Start by using a pestle (or a wooden spoon) to mash together a few anchovies and some freshly grated garlic. The anchovies will fall apart quickly, and then you can move on. Next, add a little mustard, Worcestershire sauce, and lemon juice. Whisk it all together, and then whisk in plain yogurt and a little Parmesan cheese. Quick Tip: If you prefer total control over the amount of dressing on your lettuce, you could also make this dressing on the side and then toss it with the lettuce. Once you’ve made the dressing, and the croutons are ready, quickly sear the salmon. Then, flake the salmon apart, and set it aside. Need more help? Check out this tutorial on How to Pan-Sear Fish. Add the lettuce and a little more Parmesan cheese to the bowl with the dressing, and toss it all together. Add the croutons, add the salmon– and voila! You’ve got a restaurant-quality Salmon Caesar Salad that’s perfect for lunch or dinner! This Salmon Caesar Salad is a healthy and delicious take on a classic Caesar. It features easy, homemade dressing, freshly baked croutons, and pan-seared salmon. Pat salmon dry, and set aside. Allow salmon to come to room temperature while you prepare the rest of the salad. Toss bread in garlic, olive oil, and salt. Spread onto a baking sheet. Bake 11 minutes for soft croutons, or 14 minutes for crunchy croutons. Set croutons aside. Use a zester to grate garlic. (Alternatively, finely dice garlic.) Place in the bottom of a large salad bowl. Add anchovies to the bowl. Mash with a pestle or with a wooden spoon, until the anchovies have dissolved. Whisk in lemon juice, mustard, and Worcestershire sauce. Add the yogurt and the Parmesan. Whisk until smooth. Sprinkle salt on the salmon. Add 1 TB olive oil to a heavy bottom pan, and heat over medium-high heat. When the oil is hot and begins to ripple, add the salmon skin-side down, and do NOT touch the salmon. If the fish begins to smoke in the pan, lower the heat slightly. Remove fish from the pan, flake it apart with a fork. Discard skin if desired. Cover fish to keep it hot. Add diced romaine and the remaining Parmesan to the large bowl with the dressing. Toss salad until it's coated in dressing and there is no more dressing pooled at the bottom of the bowl. Add croutons and salmon to the salad, and serve immediately. This recipe easily doubles or triples. I grew up in the Pacific Northwest, and I love salmon just as one from that region should. Even though Caesar salad is one of my favorite foods, I’ve never tried it with salmon. I think it’s time to fix that! Caesar salads are my absolute favorite. You are such a rockstar – making your own croutons too! I’ve never tried salmon on a caesar but this looks amazing. I’ll be on the lookout for that brand! What a gorgeous looking salad! The flavor combination sounds perfect too, I would make it right now if I had salmon in the house. I can imagine this as a quick lunch idea. btw find your detailed tips super useful and well explained! Aww thanks Helene! I hope you get a chance to try it soon! YUM! Love the idea of a salmon caesar salad and love that you made the dressing from scratch too! We use plain yogurt in our house for everything. Love that you used it in your dressing! I’ll have to look for that salmon the next time I go to the store. Sounds like it will be perfect for my grocery budget! And I was pleased to see that I can get Orca Bay at the nearest Costco to my new home. I’ve bought North Atlantic fish directly from the fishermen in my old home for so long, I wondered what I would do when I moved inland… and had thought that finding good quality frozen might be a good option. I’ll have to try this! Oh that’s awesome Anne! I’m so glad I could help! I’ve never heard of pink salmon but I will definitely be on the lookout for it in the freezer section of my local grocery store. The salad looks incredible! I like that the dressing is made with yogurt and is totally doable and not intimidating at all. I have to confess, raw eggs scare me to bits! 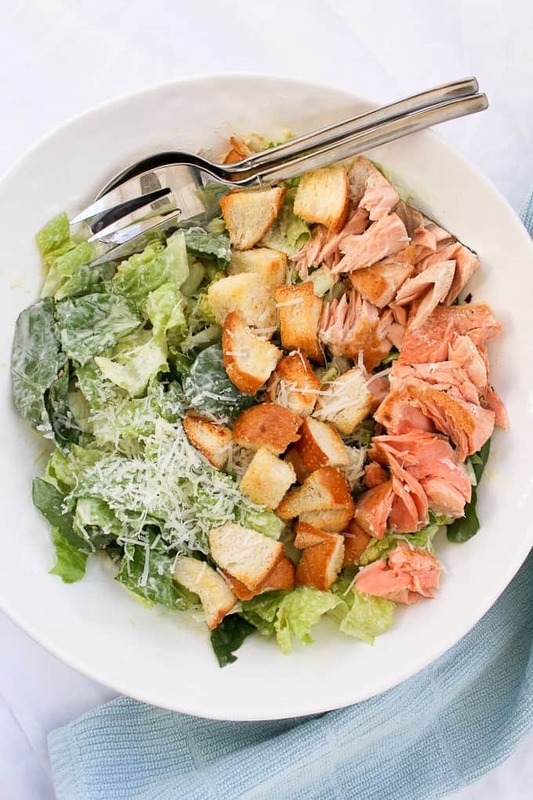 I have never tried caesar salad with salmon but it looks and sounds delicious! I’m definitely giving this a try! This sounds and looks SO good! I really love salmon caesars, and have also made my own dressing using cashews. I will have to try it with yogurt next time! I love a good salad with salmon on top! This totally leaves me craving warm summer nights, when all I want for dinner is a big fresh salad and some grilled salmon or steak on top. Such a delicious, easy meal! Caesar salads are so good and such a classic. I’ve never tried a Caesar salad with salmon. That sounds so good and would be so simple to make. I definitely see this in my dinner future! I have never tried caesar salad with salmon and I have no idea why! It looks delicious! This is gorgeous and that dressing has me all excited! Yum! I have never been a fan of Caesar salad (especially at restaurants) because it always appeared so dry to me but you’ve finally piqued my interest with the addition of salmon in yours. I’ll eat anything with salmon so I’ll be giving this a revisit! I love caesar salad and the addition of the salmon and that dressing really does make it bomb diggity (yay for that phrase too, I’ve missed it). Thanks!!! And let’s bring bomb diggity back LOL. Just keep saying it- it’ll catch on! Caesar salad is one of my favorites, but I’ve never had it taken to the next level with salmon! What a fantastic idea! I used to get a calamari Caesar back in college, and it was one of my all-time favorite salads ever. The salmon must go with that creamy dressing even better. Plus, homemade croutons, yay! You know how I feel about those. 🙂 Thanks for linking! Calamari caesar salad sounds AMAZING! Maybe I’ll try that next! Ha I literally just got back from ordering my favorite salad at my favorite restaurant and it just never tastes the same at home! Love this yummy sounding salmon caesar, a must try! !